The world of lonely, middle-age policewoman Beauty Cuba changes forever when she receives a call for help from Billy, the lost love of her life who has recently been re-arrested for murder. Beauty returns to her home town of Beaufort West, deep in the heart of the surreal landscape of the Karoo semi-desert and quickly learns that this case is not as simple as she thought. The real culprit of this accidental murder is a painfully shy young woman named Natalie who flees her small, rural town on horseback and teams up with her now pregnant childhood friend Poppie to outrun the law. 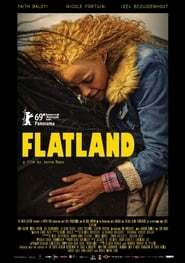 Flatland is a journey of self-discovery for these three different but equally desperate women, painting a vivid and unique portrait of femininity against a hostile frontier-land and questions what it means to be a women in contemporary South Africa and the world at large.